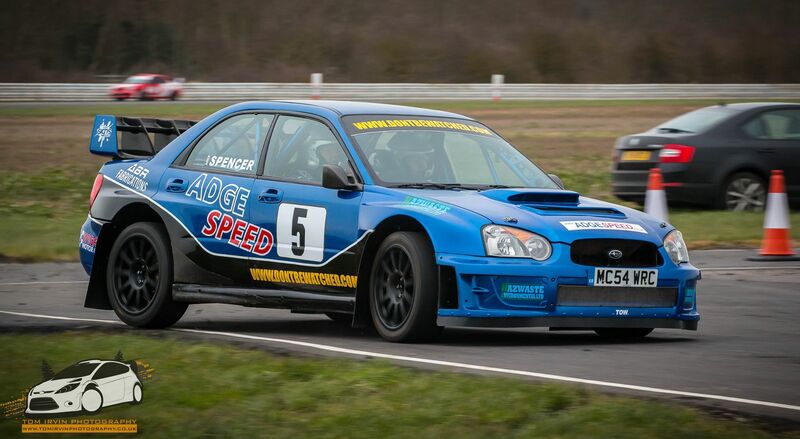 Saturday 20th February and it was time Adrian Spencer in the Adgespeed backed Subaru Impreza WRC S11 to get some more seat time in preparation for the 2016 National Tarmac Championship. Having only done the Neil Howard Stages back in November 2015 since buying the car and with the engine refreshed for the season, the team decided to enter the Jack Neal Stages Rally held at Blyton in Lincolnshire, featuring 10 stages of 3.5-5 miles of good tarmac. With the weather dry and soft slicks fitted Adrian set off for the 1st stage and with a good clean run set the fastest time, which he repeated on stage 2 to take the lead by 6 seconds from Mark Roberts with Tom Morris in 3rd. The conditions stayed the same for stage 3 but a mistake by Spencer saw him stall the car at a hairpin losing approx 15 seconds and dropping down the order to 3rd with Bell who was starting to put in some quick times taking the lead by 1 second from Roberts and 3 from Spencer. On stage 4 Adrian had a clean run, but beat the bogey time for the stage along with Tom Morris, but this allowed Adrian to move up to second, the fight back was on. For stage 5 it started to rain and with the track not yet fully wet, intermediates were bolted on and with Indri starting to show some pace with fastest time, Adrian was still in 2nd only 3 secs behind Bell. Sticking with the same tyres for stage 6 Adrian again set the fastest time to move back into the lead by 3 seconds from Morris, but it saw a change in the order as Bell spun off and lost over 2 minutes getting going again which dropped them out of contention. By Stage 7 Adrian decided that wets would be used but this proved to costly as the new tyres took a lap to bed in resulting in some off track excursions due to the lack of grip and with Morris setting the fastest time he took the lead by 10 seconds and this dropped Adrian to 2nd. Disaster struck for Mark Roberts when his engine gave up the ghost which moved Indri up to 3rd. With it all to play for they competed stage 8 but all three beat the bogey so there was no change. Although disappointed at not having won, lessons had been learnt and valuable seat time gained, Adrian was delighted to have been challenging for the win and more importantly beating John Indri the cars previous owner.